We loved Karen Gillain's take on Nebula in Guardians of the Galaxy - if only there was more of it. 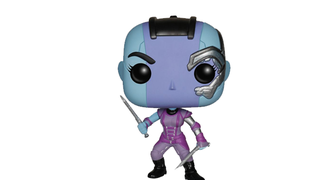 But while it might be a while until we see more of her, at least now we're getting some Nebula merchandise, in the shape of a new Funko Pop! Vinyl. The second wave of Pop! Vinyls from the movie gives us the villains and some important secondary characters - Yondu, The Collector, Ronan and Nebula. They're joined by a plus-sized 6-inch tall Thanos, who looks far too adorable for the sinister Mad Titan's own good. Check them out below! That grin! Who's the cutest little Titan this side of the cosmos?